Armed thieves have stolen 275lb (125kg) of gold bars from a truck on its way from Florida to Massachusetts. The gunmen are still at large, with the transportation company offering a reward of $50,000 for information leading to their arrest. The armored truck with gold bars packed in barrels was traveling from Miami to Attleboro, Massachusetts, also known as ‘Jewelry City’ because of the large number of manufacturers there, when it was robbed on a rural stretch of Interstate 95 in North Carolina late on Sunday. A manhunt for the gunmen has since been underway, led by Wilson County Sheriff’s Office and joined by the FBI. "We have been notified and are coordinating with our law enforcement partners to determine whether a federal crime has been committed," said Shelley Lynch, public affairs specialist of the FBI Charlotte Division, as cited by the Wilson Times. The two guards employed with Transvalue Inc., who were transporting the gold, told investigators there had been a mechanical problem with the truck, causing them pull the vehicle to the side of the road. Shortly after that, a white van with three armed men stopped near. The gunmen tied the guards’ hands behind their backs and marched them into the nearby woods. 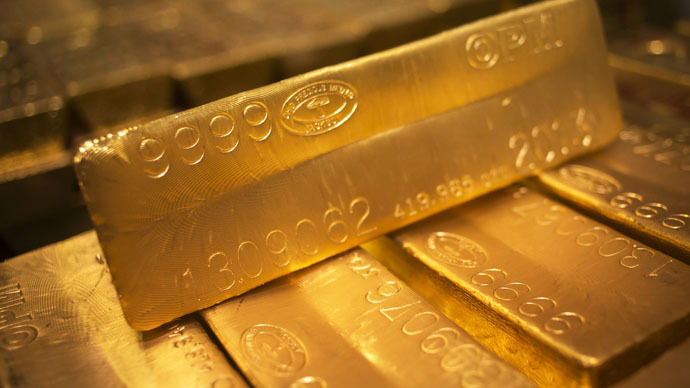 The thieves eventually got away with an estimated $4.8 million in gold bars. However, they reportedly didn’t steal everything from the truck. It’s not yet clear how much was left. "At this time we are working with the authorities to try and resolve this matter," said Transvalue CEO Jay Rodriguez, as cited by AP. "We are offering a $50,000 reward for any information leading to the arrest of these criminals." Transvalue, which specializes in transporting cash, precious metals, gems and jewelry in armored trucks, says its shipments are insured for up to $100 million.